Platforms, exceptional fringing, iridecent shades and discordant arm candy; the simple recipe to get noticed anywhere (not just at fashion week!). Whilst sporting a concoction of all the above may result in people gawping open mouthed at you as you walk down the street, wearing statement accessories like a pro is the sure fire way to get noticed in an 'Omg she looks soo cool' way not a 'Omg she looks like a crazy bag lady' way, because Im sure we'd all prefer the former Ive scoured the great brittish high street for some look-at-me statement accs just for you. Although I do know not all of us common folk may be able summon enough courage to strut around in sci-fi inspired McQueen shades like that lovely lady above, I've also included some undercover statement peices too that can add more of a bootcut type flare to an outfit rather than a 70's bell bottom. 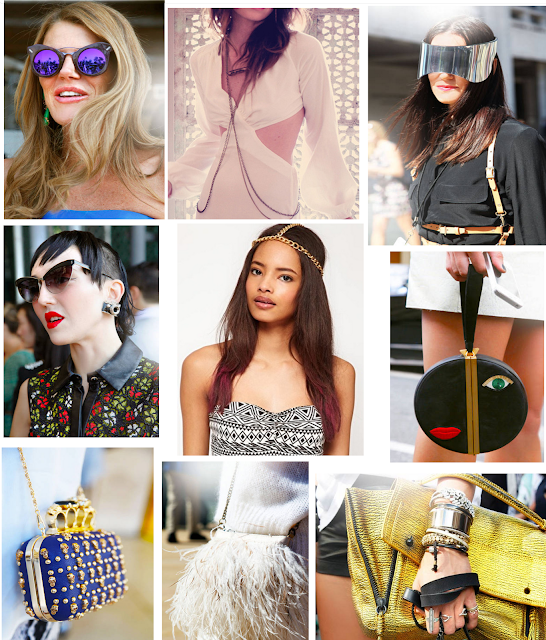 Hope you enjoyed the post my lovelies, which accessory would you dare to wear? Also you have to check out my friends tumblr ~ http://bitchlingual.tumblr.com/ ~ its amazing and she totally inspired me to do this post so follow ofcoarse, will love you forever! Those sunglasses are beyond amazing! Fabulous picks, love them all! Cutler&Gross makes very cool colorful mirror shades.